Brett Westwood explores the role daffodils play in art, medicine, literature and belief. They are harbingers of spring and signs of hope, also of self obsession in Greek mythology. Wordsworth's famous poem is always in the top 5 most loved poems in English. His encounter with daffodils in the Lake District has become a romantic expression of our relationship with nature. They are radiant beauties that bring hope to the heart after the long winter months. A A Milne also wrote charmingly about daffodils laughing off winter in his poetry for children. The native flowers are delicate and small, unlike the cultivated, rather brash varieties that adorn roadside verges and roundabouts, creating much daffodil snobbery. Daffodils are the national flower of Wales, though only since the 19th Century, promoted by Lloyd George who thought them more attractive than leeks. Attractiveness though led them to be associated with vanity, the Greek Narcissus (daffodils in Latin: narcissus) fell in love with his own reflection and pined away. Their appearance in Lent gives them the name Lenten Lilly and associated with resurrection, but in Eastern cultures it is the flower of wealth and good fortune. It has been used throughout history as a medicine, despite being toxic. Today it is grown extensively in Wales as its bulb contains galantamine, a drug used in the treatment of Alzheimer's. Whatever way you look at daffodils they are quintessentially a part of human cultures wherever it grows and can be considered the flower that brightens Britain after long, cold winters. 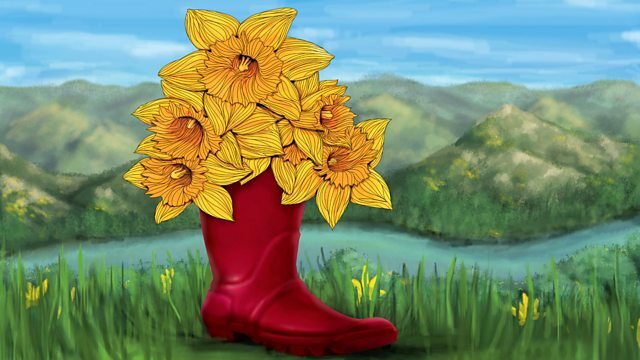 Natural Histories Comedy - Take your places for the Wordsworth daffodil tribute act. Dr Fred Rumsey is Angela Marmont Centre Enquiries Officer, Plants, at the Natural History Museum in London. He has a strong interest in conservation and deals with plant identification enquiries within the Identification and Advisory Service team. He also provides expert taxonomic advice to various Taxon Groups, sits on the International Union for Conservation of Nature (IUCN) specialist groups and referees for several families for the Botanical Society of the British Isles. Sally Bushell is Professor of Romantic and Victorian Literature at Lancaster University. Her primary research specialism is in British Romanticism, the poetry of William Wordsworth and the interpretation of poetic process. Her first book was Re-reading The Excursion. She then co-edited the Cornell edition of The Excursion and published Text as Process: Creative Composition in Wordsworth, Tennyson and Dickinson. Monty Don is best known for his presence on BBC television's Gardeners’ World and BBC Radio 4's Shared Planet and is the author of several books. He lives close to the land, not only through his garden which features weekly on Gardeners’ World but in the hills near where he lives, where he farms sheep. Fflur Gwynn is Senior Curator of Cultural Life at St Fagans: National History Wales. She oversees collections relating to music, folklore and customs, cultural, educational and social institutions, popular culture, sports and children's toys and games within Wales. She has an MA in History of Design from the V&A Museum and the Royal College of Art and her specialist subjects include Welsh music and popular culture and 20th century craft. Jayne Lawrence is Professor and Head of the Pharmaceutical Biophysics Group. She is currently on a part-time secondment at the Royal Pharmaceutical Society (RPS) as their Chief Scientist. Jayne is particularly interested in understanding how the structure of a molecule influences the molecular architecture of the delivery vehicle it forms and its fate in the target cell. To achieve these aims she uses a range of advanced analytical techniques including light and neutron scattering and reflectivity. Fleur Rothschild, PhD, has worked in Birkbeck College, University of London, since 1998. She established the Academic English Unit in Birkbeck for the induction of International Students into the culture, practices and horizon of expectations of the British Higher Educational system. Fleur has lectured on Chaucer, Shakespeare and Early Modern drama and is currently the Learning Development Co-ordinator and Tutor for the School of Arts. She has an abiding passion for plants of all kinds and is a guerrilla gardener. A particular fascination is with daffodils and she has a book forthcoming on Reaktion Press about the daffodil's horticultural and cultural history.